Before graduating from Stetson University in May, Erin Scully talked about looking for her dream job and how difficult it would be to find a teaching position with a high school choir. But in just a few weeks, she starts as a choir teacher at South Lake High School in Groveland, Florida. Scully credits her experiences at Stetson with helping her land the position, and even more to helping her feel confident to step into her new role when school begins in Lake County next month. During her time in Stetson’s School of Music, she served as vice president and section leader for the Concert Choir; president of the Stetson chapter of the American Choral Directors Association; and as a teaching intern at a Seminole County high school during Spring Semester. “I think it was a combination of my senior internship, which I did at Winter Springs High School, and I just had an amazing experience there and learned so much and I feel so much more confident as a teacher now from just being in that classroom every day for the semester,” said Scully, who received a Bachelor of Music Education. This summer, she worked as a counselor for the second time at Stetson’s Vocal Camp for high school students. She has toured with the Concert Choir, and traveled to Germany and England to study Bach and Handel with a Stetson student group. She hopes to return to college one day for a master’s degree, possibly in choral conducting. While at Stetson, she took independent study in choral conducting with Anthony Hose, associate professor of Music, Orchestra, and was given the opportunity to conduct a chamber orchestra. 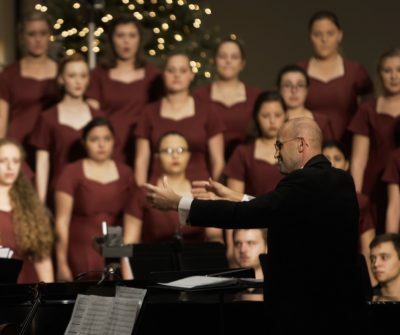 Andrew Larson, D.M.A., professor of Music and associate director of Choral Activities, allowed her to conduct the Women’s Chorale during the Russian Music Festival Concert during her senior year. Andrew Larson conducts the Women’s Chorale. Scully’s passion and dedication were well noted by her professors. For instance, she never missed a single choir rehearsal. “Erin is so passionate about music education, and went way beyond requirements with her senior recital, and came through with a strong performance. 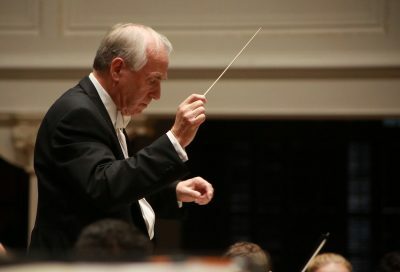 Bravo!” said Jane Christeson, professor of Music, Voice. Erin Scully starts as a high school choir teacher in Lake County in August. 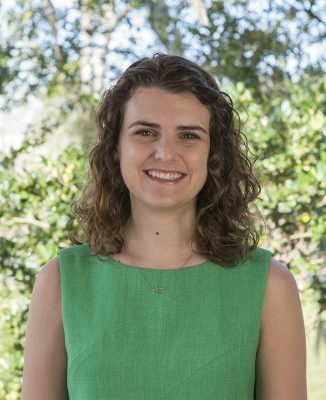 “Erin has been an outstanding student leader in the Stetson Choral Program and did many great things with our student chapter of American Choral Directors Association,” said Timothy Peter, D.M.A., interim dean of the School of Music and director of Choral Activities. As she readies for her first job, Scully said she is thankful for her time at Stetson. 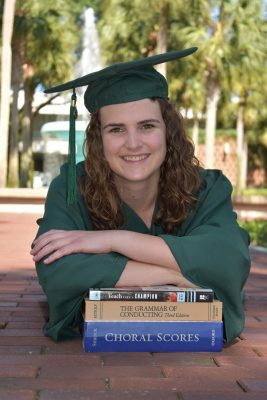 “With all the opportunities that I’ve been able to have at Stetson — between leadership and conducting and traveling – everything has helped me become so prepared to be able to walk into my first job,” she said.